On April 10, 2018, a nonprofit public interest organization, the Lawyers’ Committee for 9/11 Inquiry, will file a petition with the U. S. Attorney in the Southern District of New York demanding that he present to a grand jury extensive evidence of so-far-unprosecuted federal crimes relating to the destruction of three World Trade Center Towers on 9/11/01—evidence that the group claims is conclusive. The petition explains that the U. S. Attorney is legally required to present the evidence to a grand jury. Expert analysis of seismic evidence that explosions occurred at the WTC towers on 9/11prior to the airplane impacts on the WTC Towers, and prior to the building collapses. Firefighter reports of explosions, and of seeing “molten iron like in a foundry”. Thepetition states that the presence of molten iron would require temperatures higher than jet fuel and building contents could create when burned, but consistent with use of the high tech explosive and incendiary thermite or thermate. Scientific analysis, eyewitness testimony, and government reports confirming sulfidation and high temperature corrosion of the steel found in the rubble after the collapse of the WTC towers and WTC 7, a phenomenon not expected in a jet fuel fire and gravity collapse but consistent with the use of thermate. Although 9/11 activists have maintained for years that evidence of controlled demolition techniques having been used at the World Trade Center emerged after the release of the official 9/11 Commission Report, subsequent administrations have declined to investigate that evidence. 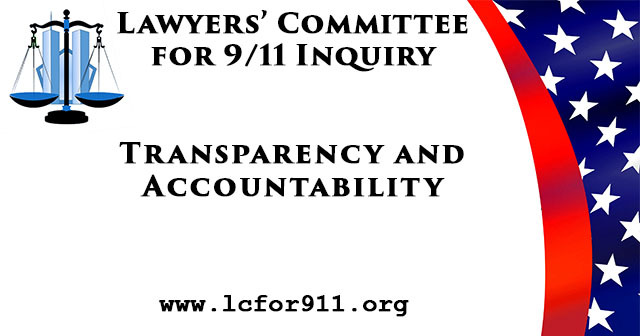 The Lawyers’ Committee for 9/11 Inquiry is a nonprofit, 501( c )(3) organization devoted to conducting investigations and public education in the public interest regarding matters related to the tragic events of September 11, 2001 (hereinafter referred to as “9/11”) and the circumstances leading up to and following those events, with a focus on government accountability regarding investigation and prosecution of those responsible for the crimes related to 9/11 (whether those responsible are foreign or domestic individuals, corporations, or government entities). Its website is www.lcfor911.org.